1) The prices of the steaks at Gustavus Steak Lounge is much higher than what I usual pay for food (and rent). Oh and I'm not just saying this for fear of losing my job. Gustavus guarantees you one of the best steaks you'll ever have in your life, but I assure you, it's so much more than a Steak Lounge. Located along C. Palanca St., I pass by this restaurant every day, because it's in the ground floor of the building where my office is. Unfortunately, As much as I enjoy the food, like I said, it's a bit too pricey to be going to on a daily basis. Going in there, you feel a sense of luxury without the usual stiffness of a fine dining restaurant. Maybe I'm biased because I'm all ready friendly with the waiters, but as I observed other guests, I must admit, the service staff really do an excellent job of making a customer feel like they are the most important person in the room. I don't eat oysters. Really, I don't. 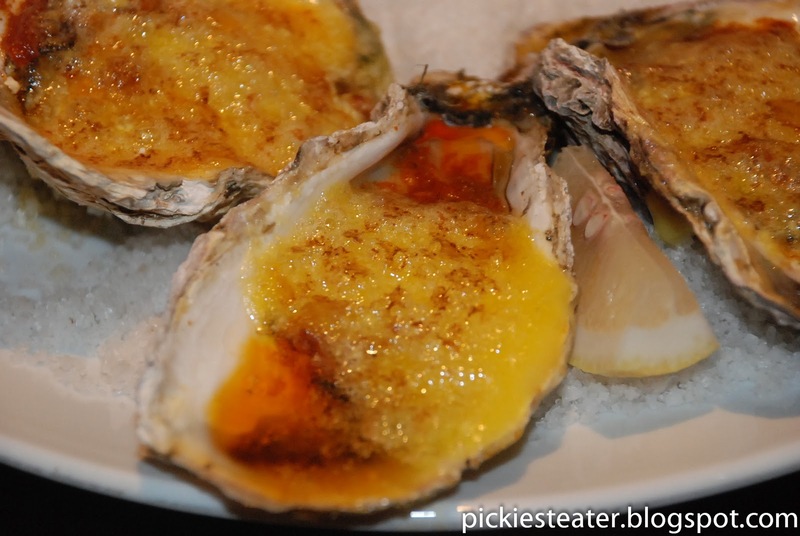 In fact, the last time I ate an oyster was back in the early 90's, when I had some "Fried Oysters" from the old Cebu Restaurant called "Ribo's" (Those were actually pretty good.. I wonder what happened to "Ribo's"?). My boss though, insisted I try the Baked Gustavus Oysters (P390), because it's one of the most popular items on their menu. And believe me, my boss is a hard man to say no to. Under the watchful eye of my boss, I reluctantly tried one of the oysters. I was pleasantly surprised, that it actually went down my throat (With its texture, any oyster I attempt to eat usually just rolls around in my I until my eating companion isn't looking, and I immediately spit it out into my tissue). It actually tasted like a pizza with an oyster as it's base. It was drowned in a thin herb tomato sauce, and topped off with a generous amount of cheese. 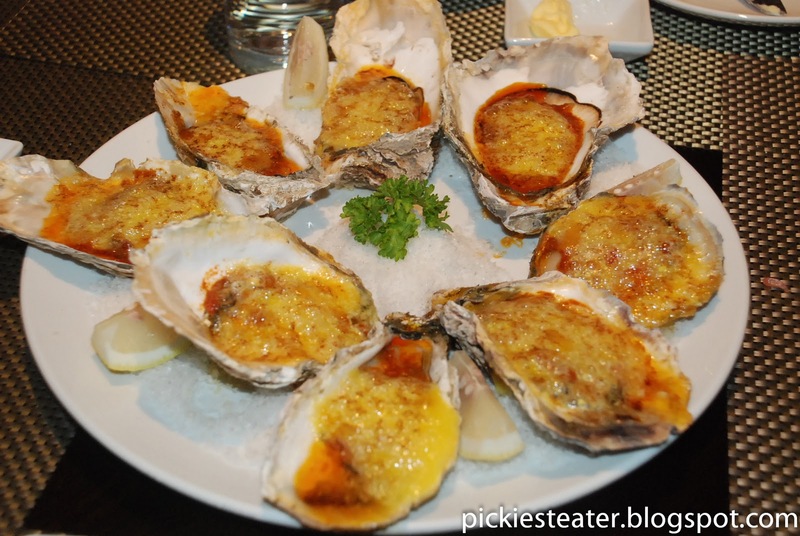 Although I hasn't sold me on oysters, I have to admit, this is the only Oyster Dish that I can eat. Trust me, that says ALOT. Oh and the rolls they serve are really good, especially when piping hot and smeared with soft butter. 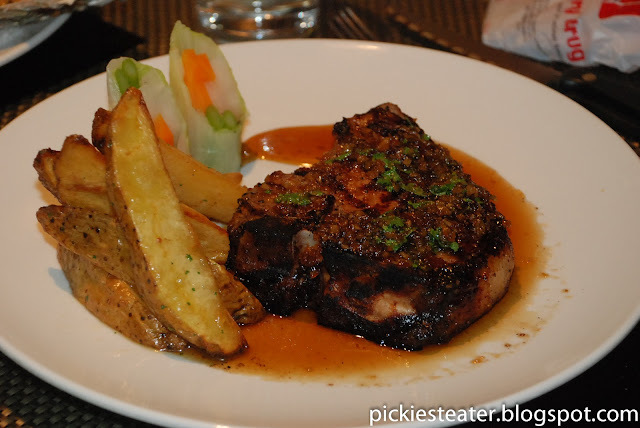 My boss ordered one of my favorite dishes from the restaurant, the Grilled Gustavus Grilled Pork Chop (P490). 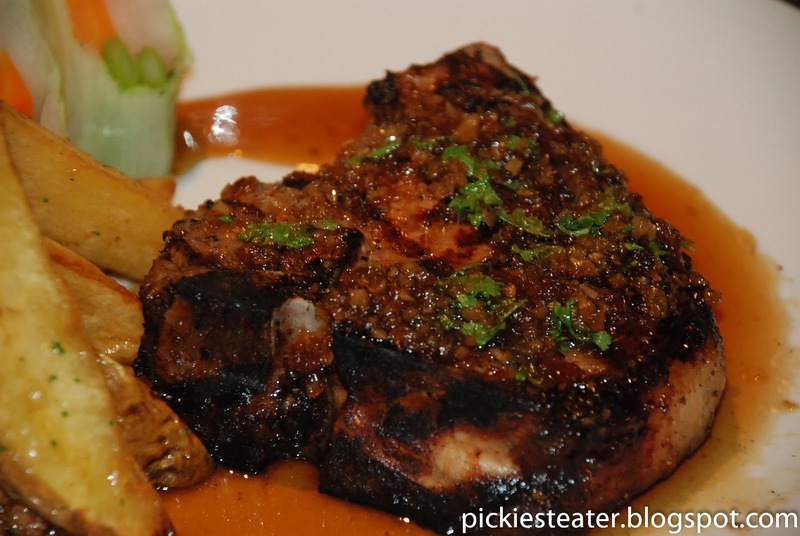 The Pork Chop is doused in a glazed sauce, giving it a deliciously sweet kick to it. The Chop was grilled masterfully, leaving char marks on the side, but keeping the inside, pristine white. The Pork Chop itself is thicker than the usual ones that i'm used to, so expect this to be a very heavy meal. 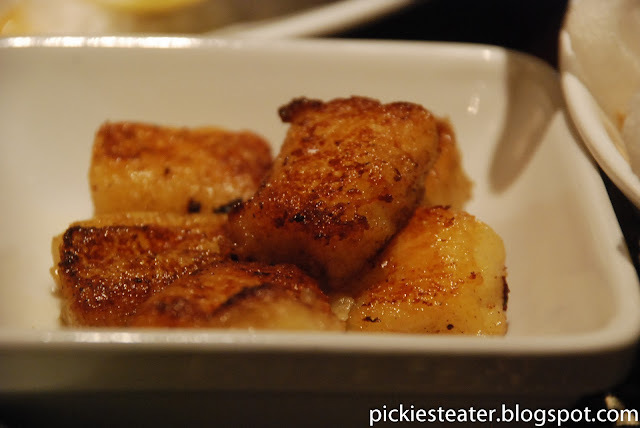 It also comes with a side of Potato Wedges, which are excellent, especially when soaked in the glaze sauce. My only comment is, I wish they would use cuts with more fat (But that's just me). The Ribeye Steak I ordered had a choice side order of either Rice, Potato Wedges, Mashed Potatoes or Gnocchi. I always get their Gnocchi, no matter what I order. Gustavus' Gnocchi was the first I had ever tried, so I don't have a point of comparison, but I don't think it gets much better than this. It has a weird, gummy texture inside, but has a delicate crispiness on the outside. Regardless, the flavor of creamy potato-ness is unmistakable - and delicious. I don't care if it's drowned in butter.. It's something everyone must try. I strongly suggest trying the Potato Wedges and the Mashed Potatoes as well. The Gustavus Cut can be shared by four people. (But when i'm involved, two people). 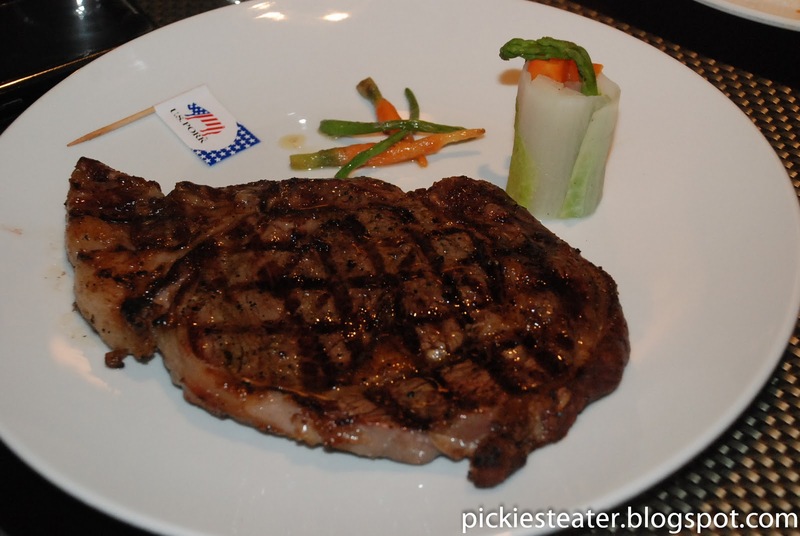 My Rib Eye Steak arrived (Regular Cut P1,955/Gustavus cut P2,611) and it was grilled to perfection. Even though it was supposed to be the smaller cut, it was still pretty large on its own. 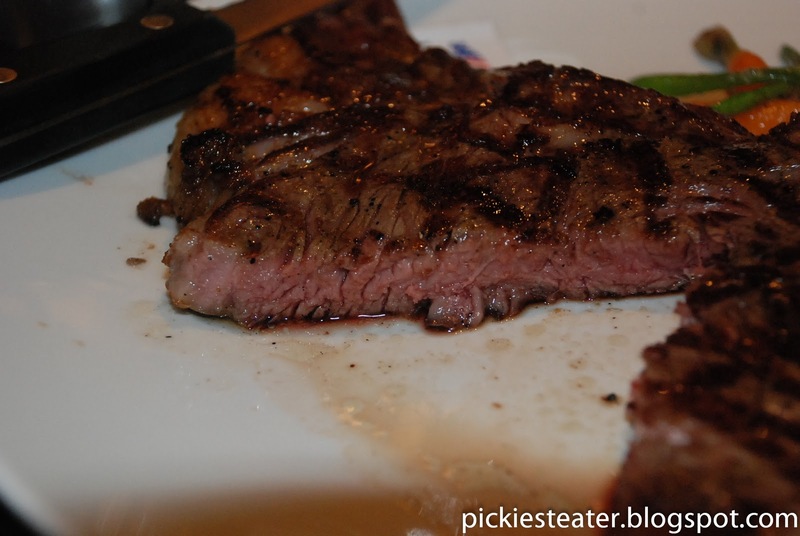 The meat was so tender, you barely needed a steak knife to slice through it. And the ratio of fat to meat was perfect. When slicing through the steak life, you can see the juices just bursting out, and the aroma is magnificent. In case ya'll didn't notice.. I really love me some steak. If i were to nitpick, I would say the only problem with this dish would be the plating, which isn't really all that creative (It's a cabbage roll and some mutant looking carrots). But once you get a whiff of the steak, you won't even care if you're eating it on a slab of rock. It was so good on its own that I almost didn't realize that they neglected to give me gravy (I only had a few bites left when i realized). I wanted to try their Tres Leches cake, because it was something that my brother makes, and it was really good. 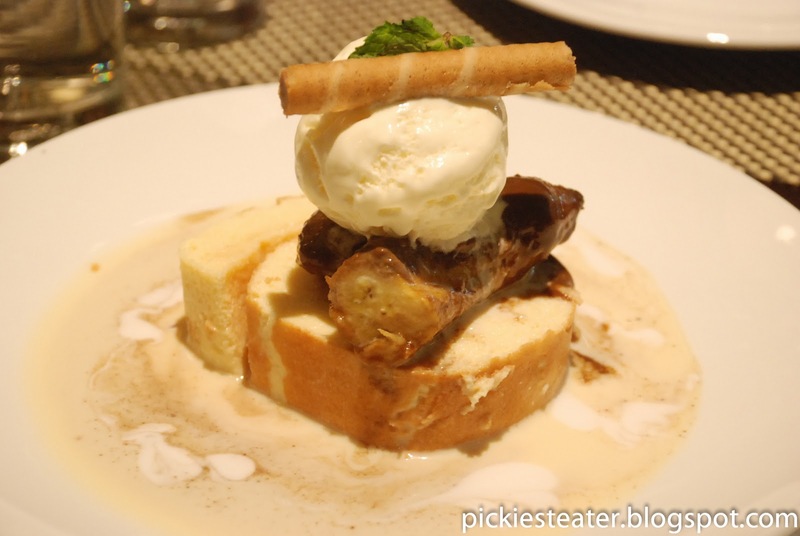 Gustavus' version was quite tasty as well, as they added a little twist to it by serving it with a caramelized banana and a scoop of Vanilla Ice cream. The cake on it's own was superb, and every bite had a rush of milk in it (which, if i'm not mistaken, is the concept of tres leches). The Ice cream helped create a balance between the richness of the cake and the sweetness of the banana. The only thing I could say was that the banana could have been cooked a tad bit more to make it softer. When it comes to steaks, you won't find very many places that can top the quality of Gustavus. Even their other dishes are fantastic, such as the Braised Chicken with Mushrooms (P570), Mr. D's Ultimate Beef Burger (P525), and the Gustavus Steak and Cheese Sandwich P400. And by the way, I mean it when I say that I'm saying this not because i'm aware of the high unemployment rate in the country - But because it's based on solid facts. Though you do pay a steep price for it, the quality you get in return is top notch, and it's clear that you're paying for excellence. My name is Rachelle, I am working at streetdirectory.com Singapore. We are currently giving away a free Webpage in PH (particularly for Restaurants/food chains). May I ask permission to use your photos? Your blog's URL will appear on the photo,with clickable- link back to your blog. We are going to get photos of the restaurant/establishment that are in your blogs. For instance, Gerry's grill is in your blog, then we will use Gerry's grill's photos to upload in Gerry's grill free webpage. Mostly food photos. Interior and exterior of the restaurant are also fine if available. And again your URL will appear on it. I hope to get a reply from you soon.